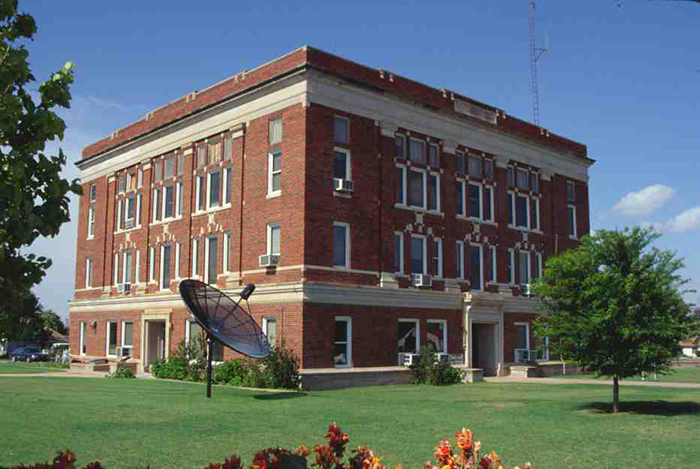 Located in far southwestern Oklahoma, Harmon County is bordered by Beckham County on the north, Greer County on the northeast, Jackson County on the southeast, the state of Texas on the west, and the Red River (Texas) on the south. Named for Judson Harmon, of Ohio and U.S. attorney general during Pres. Grover Cleveland's administration, Harmon County was established in 1909 and Hollis designated as the county seat. Situated in the Gypsum Hills physiographic region, it is drained by the Red River and its tributaries, the Salt and Elm forks of the Red River and Lebos and Turkey creeks. According to a 1981 archaeological survey report Harmon County has fifty-three known sites. Evidence indicates occupation during the Paleo-Indian and Plains Village periods and possibly the Archaic or Woodland periods. In the 1800s the Kiowa, Comanche, and Arapaho and other Plains tribes traversed this area during hunting trips. Early ranches in the area included the T-Cross, the Hughes, and the Francis. All three were established in the 1880s. Other ranches operating in future Harmon County were the O. M. Ranch and the Rose Ranch. The area encompassing Harmon County was located in Greer County, Texas, until a U.S. Supreme Court decision made it part of Oklahoma Territory in 1896. On May 22, 1909, area residents, by a vote of 1,410 for and 326 against, balloted in favor of forming Harmon County from a portion of Greer County, Oklahoma. On June 2, 1909, citizens received a message from Gov. Charles N. Haskell proclaiming Harmon County as the seventy-sixth county and designating Hollis as the county seat. Another election held on September 1, 1909, placed Hollis in competition with the towns of Harmon and Rosser for county seat. Hollis was victorious with 855 votes compared to 459 for Harmon and 691 for Rosser. Before the courthouse was completed in 1926, county officials conducted business in rented space. The Layton, Hicks and Forsyth architectural firm designed the building. The Harmon County Courthouse is listed in the National Register of Historic Places (NR 84003031). On March 17, 1930, the U.S. Supreme Court ruled that the true 100th Meridian was actually thirty-eight hundred feet further east, based on a survey accomplished by Samuel S. Gannett between 1927 and 1929. This changed the boundary between Texas and Oklahoma and, thereby, Harmon County's western boundary was also changed, reducing the county's size to comprise 538.56 square miles of land and water. Agriculture has been the mainstay of Harmon County's economy. Principal crops have included cotton, wheat, and sorghum. In 1909 Harmon County had 1,312 farms, of which tenants operated 36.5 percent. Farmers planted 57,271 acres in cotton, 22,092 in corn, and 1,969 in wheat. By 1930 Harmon County had 1,799 farms, and tenancy had increased to 61.8 percent. In 1930 livestock numbered 7,352 cattle, 8,984 poultry, 3,064 horses, 3,342 mules, 875 swine, and 383 sheep and goats. A cotton oil mill and thirteen cotton gins operated in Hollis and Gould in the 1930s. In 1963 farmers planted 56,800 acres in wheat, 42,000 acres in cotton, and 15,900 acres in sorghum. That year cattle numbered 20,000, milk cows 1,000, chickens 16,500, hogs 900, and sheep 800. The number of farms has dwindled from 1,762 reported in 1910 to 1,040 in 1950 and to 338 in 2000. Through consolidation the average farm size has increased from 170.6 acres in 1930 to 899.9 acres at the turn of the twenty-first century. A few manufacturers have supplemented Harmon County's economy. In the 1930s a mattress factory operated. By the 1950s the Foster Company was constructing grain elevators and feed mills, and the Jourlex Corporation was producing women's purses and other leather goods. Both were located in Hollis. At the turn of the twenty-first century the Western Fibers Insulation Plant and the Buck Creek "Honey" Mesquite Company employed residents. Early transportation routes followed the waterways and American Indian trails. The Camp Supply Road connecting Camp Supply (later Fort Supply) in present northwestern Oklahoma with the Red River traversed the northeastern corner of present Harmon County. In 1910 the Altus, Wichita Falls and Hollis Railway (later the Missouri, Kansas and Texas Railroad) constructed a line from Altus (Jackson County) to the Oklahoma-Texas state line that passed through Hollis and Gould. U.S. Highway 62 traverses the county east and west connecting Hollis, Gould, and McQueen. State Highway 5 runs north and south and connects Gould with Lincoln in Jackson County. State Highway 9 crosses the northern part of the county. State Highway 30 runs north and south and connects Hollis with Interstate 40 to the north. At the turn of the twenty-first century private and municipal airports operated near Hollis. In 1959 Harmon County had three post offices (Hollis, Gould, and Vinson) compared to fourteen in earlier years. Hollis and Gould continued as incorporated towns in 2010. Unincorporated communities included Arnett, McKnight, Madge, and Vinson. Representative of former communities are Teacross and Ron. Teacross took its name from the T-Cross Ranch and was located twelve miles northeast of Hollis. It had a post office from November 29, 1899, to November 15, 1911. The ghost town of Ron existed northeast of Hollis. At its peak Ron had a consolidated school, a cotton gin, a grocery store, and a church. However, it never had a railroad, a post office, or a newspaper. The school closed in 1964. At one time Harmon County had forty-four school districts. However, by 1959 it had six consolidated districts. Vinson had the largest district covering 143 square miles. The first high school was organized in Hollis in 1909. Higher education was offered at the Hollis Junior College, which operated from 1937 to 1938. Harmon County, organized in 1909, reported 11,328 residents in 1910. Between 1910 and 1920 the county lost sixty-seven inhabitants. Population peaked at 13,834 in 1930. After 1930 the numbers steadily declined from 10,019 to 5,852 counted in 1940 and 1960, respectively. In 1980 the census indicated 4,519 citizens compared to 3,793 in 1990. At the turn of the twenty-first century Harmon County had a population of 3,283. In 2010 the residents numbered 2,922, of whom 73.2 percent were white, 7.2 percent African American, 1.3 percent American Indian, and 0.4 percent Asian. Hispanic ethnicity was identified as 25.9 percent. The Harmon County Historical Museum in Hollis preserved the local history. An annual Black-Eyed Pea Festival was held in August. The Hollis News continued to inform the citizenry. Quadruplet girls born to Flake and Alma Keys in Hollis in 1915 received notoriety during their lifetime. "Harmon County," Vertical File, Research Division, Oklahoma Historical Society, Oklahoma City. Planning Route 2: Harmon History Book II (Altus, Okla.: Altus Printing Co., 1987). Planning the Route (Hollis, Okla.: Harmon County Historical Association, 1980). Linda D. Wilson, "Harmon County," The Encyclopedia of Oklahoma History and Culture, https://www.okhistory.org/publications/enc/entry.php?entry=HA026.